In 1880, the rowdy town of Benson was born when the Southern Pacific Railroad Company recognized a market for transporting mining and ranching products to growing enterprises in the southeastern Arizona Territory. Leading up to the town's incorporation in 1924, nearly all railroads in the Southwest led to Benson, which by that time boasted several hotels, liveries, taverns, churches, and a smelter. By the 1940s, U.S. Highway 80 and State Route 86 junction brought weary travelers to enjoy Benson's clean air, artesian water, and mountain vistas, creating the core of a multiethnic city whose progeny continue to keep the town alive today as the "Gateway to the Land of Cochise." E. K. Suagee moved to Benson with her family in 1960. Moving away after high school, Suagee returned to Benson in 1987. After teaching English at Benson High School and Cochise College, she now manages the Singing Wind Bookshop, and she serves on Benson City Council. Suagee has joined with the San Pedro Valley Arts and Historical Society in preserving Benson history. 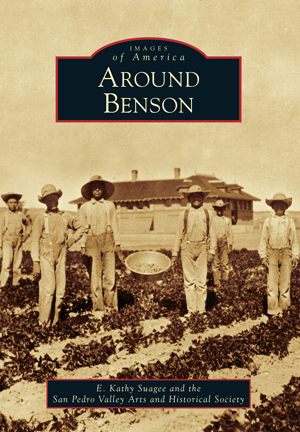 The images showcased in this book were brought to light by the vast knowledge and encouragement of Stan Benjamin, the Arizona State Library, the Arizona State University Library, and descendants of families who have filled the pages of Benson's history.